After riding a flame into Earth orbit more than three weeks ago, the dormant upper stage of the first Falcon 9 rocket plunged back into the atmosphere this weekend, a fiery finale for the historic privately-developed spacecraft. 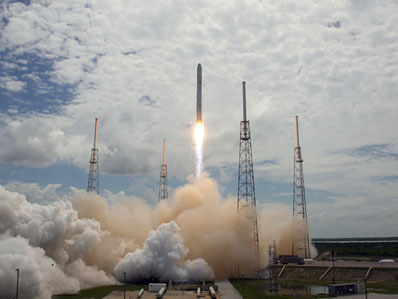 The rocket and its dummy payload entered Earth's atmosphere around 0050 GMT Sunday (8:50 p.m. EDT Saturday), according to U.S. military tracking data, but the margin of error is roughly two hours in either direction. At 0050 GMT Sunday, the truck-sized vehicle would have streaked back into the atmosphere and burned up over Iraq and Syria. But the uncertainty in the exact re-entry time means the rocket and Dragon capsule could have come back to Earth anywhere along its ground track for more than two orbits. Most of the 12-foot-wide rocket stage likely burned up during re-entry. The Falcon second stage and cone-shaped Dragon spacecraft remained bolted together after launching June 4 from Cape Canaveral. The attached duo entered an orbit approximately 155 miles high with an inclination of 34.5 degrees, reaching a trajectory very close to its launch target within 10 minutes of liftoff. About one hour later, the Falcon 9 second stage passed over Australia as it vented excess propellant from its fuel tanks. The rocket was spinning, displaying a corkscrewing cloud of vapor that touched off UFO reports. As expected, the vehicle's batteries ran out of power shortly after launch, leaving the inert rocket and spacecraft flying out of the control of engineers on the ground. With a mass of around 15,000 pounds, the rocket stage and stripped-down Dragon capsule succumbed to small forces of atmospheric drag in the weeks after launch. The drag naturally lowered the craft's orbit until Earth's atmosphere eventually captured the empty rocket for re-entry. During its 22 days in space, the rocket completed more than 300 orbits of Earth and traveled nearly 10 million miles. As the first Falcon 9 rocket spent its days circling the planet, SpaceX officials reviewed data from the monumental test flight to study what they can improve on its second flight. Engineers quickly discovered an unexpected roll as the 15-story rocket cleared the launch pad, then the Falcon's upper stage started a slow spin during its engine firing to reach orbit. SpaceX blames the liftoff roll on unexpected engine torque from the Falcon's nine Merlin first stage engines, which collectively produce nearly 1 million pounds of thrust. In an interview with Miles O'Brien of This Week in Space, SpaceX's chief safety official said teams are checking the second Falcon 9 rocket on a test stand in Texas to determine how to best fix the torque at liftoff. "There's a little bit of a swirl from the exhaust of the engines, and then all of the exhaust from the gas generators that spin the turbopumps is angled a little bit, so that just puts a twist right at the start of liftoff," Ken Bowersox, SpaceX's vice president of safety and mission assurance, told This Week in Space. "It takes a little while for the engines to gimbal and counteract the roll." Elon Musk, SpaceX's founder and CEO, said June 16 that investigators have preliminarily traced the second stage spin to an actuator fault in the roll control system. Musk did not respond to a request for an update Sunday. 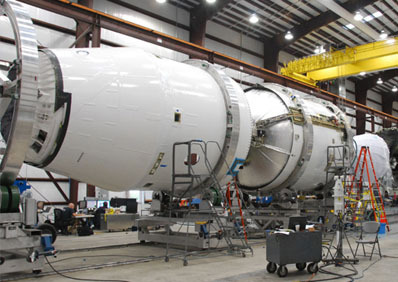 The next Falcon 9 rocket is scheduled to launch in late August, at the earliest.